The name Plug N Play comes from its ability to be plugged into a standard 15 amp outlet providing you the ease of electrical hook up. The setup process is as simple as placing the spa, filling it with water, and then plugging the GFCI cord into your outlet. The V100 & V300 come with a Lifetime Shell Warranty with a 1 Year Warranty on Parts and Labor. The V100 round and the V300 plug into a standard 15 amp plug and feature a GFCI built into the cord. 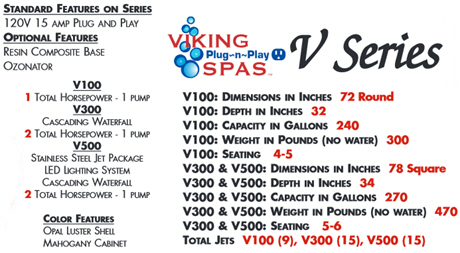 Powered by the BalboaTM VS300 Power System, the V100 features a 1hp pump while the V300 features a 2hp pump. These spas are right for weekend retreat homes or those looking to see what the hot tub experience is all about without too much of an investment.